In our Karate club usually twice a year by licensed auditors of the German Karate Federation (DKV) decreased belt tests. 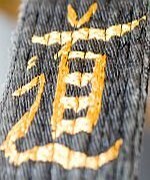 The Karate Department of DTV is a member of the German Karate Federation, and the trainer is responsible for belt tests. At the beginning of each year by the Department direction, the so-called DKV annual stamps ordered. That stamp and the associated Karate Pass (buyd once) is a prerequisite for participation in belt examinations, competitions and courses, while insurance coverage on events outside the actual karate club training sessions.